A campaign group has questioned the high speed rail scheme, branding it a waste of money, but councillors say it will bring jobs to the region. The government announced on Monday the next phase of HS2 will pass through the East Midlands, stopping at Toton, near Nottingham. 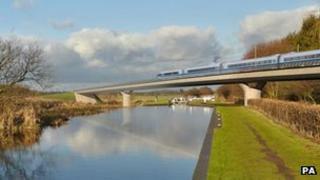 Nottinghamshire Better Transport (NBT) said the HS2 was "environmentally catastrophic". But the county council said it will unlock the area's business potential. NBT, which is part of the national Campaign for Better Transport, questioned the benefits that high-speed rail will bring to the county. David Thornhill, chairman, said: "I have rarely come across such an environmentally catastrophic scheme that is so pointless and so wasteful of money." But the government said it expected 19,700 jobs to be created as a direct result of the stations in Leeds, Sheffield and Toton. It said about 100,000 jobs will be created nationally and 10,000 construction workers will be employed to complete the project. Councillor Richard Jackson, chairman of Nottinghamshire County Council's transport and highways committee, welcomed the announcement. He said: "This is good news for the economy of Nottinghamshire and the region as a whole. "Improving the transport infrastructure is critical for unlocking the full potential of business in our county." The government claimed passengers will be able to travel from Toton to London in 51 minutes and Birmingham in 19 minutes. A regular shuttle service from Nottingham city centre will take 12 minutes.